It’s crazy how getting new workout gear can motivate you more. At least for me that’s the case. I desperately needed to get new everything! There are definitely so many stylish AND functional pieces too. H&M’s new sports collection (available online and in select stores) includes pieces that are capsuled for specific activities, such as Athletics, Running, Outdoor and Bodymind. They are all at a great price point too. This really helped when picking out my pieces. I got a couple of different pairs of leggings, but the ones that I am wearing are my favorite. 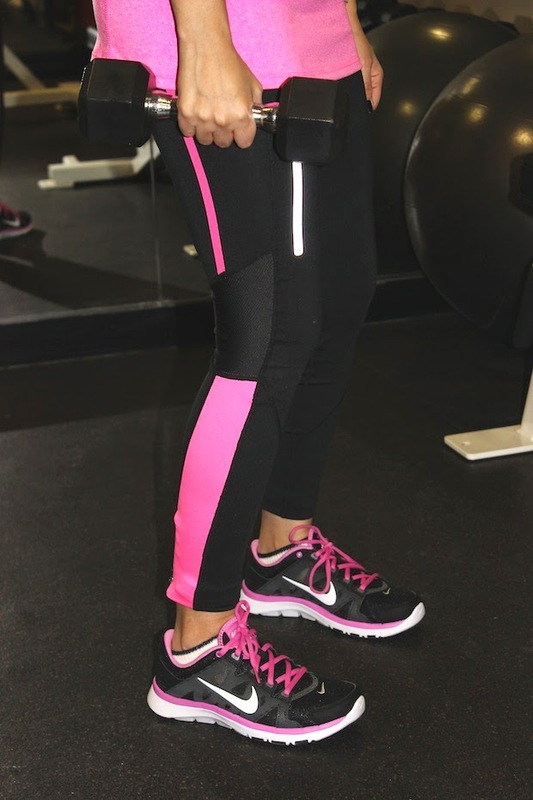 They are extremely comfortable to work out in. These are meant more for running outdoors, but I will pretty much live in them at the gym. As you can see they have reflective details and zipper elements. My sister has on a fun printed pair, which are so soft and easy to move around in as well. I love the high waist band on those. I got a sports bra and a couple of seamless running tops too, including this pink one. 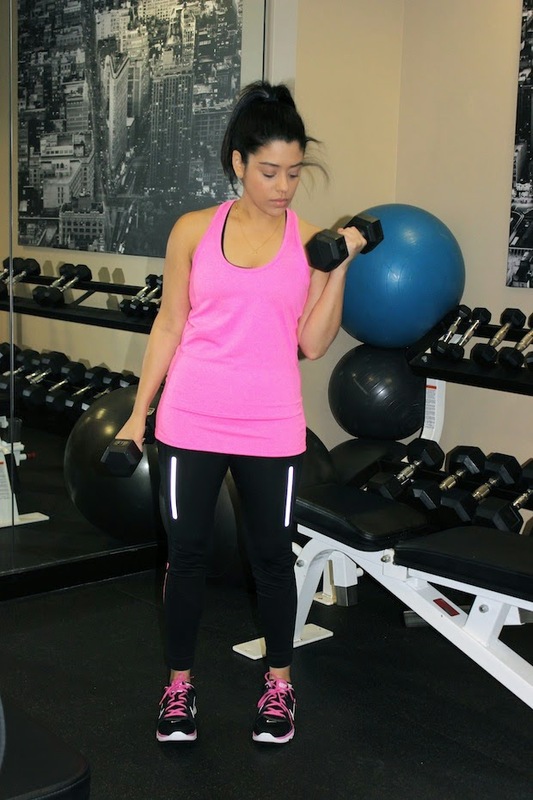 I personally don’t like to workout in tops that are too tight fitted, so I usually go up a size to make them more comfortable to do exercises. I also just got these new kicks for the gym! Seriously, feels like I am walking on clouds. 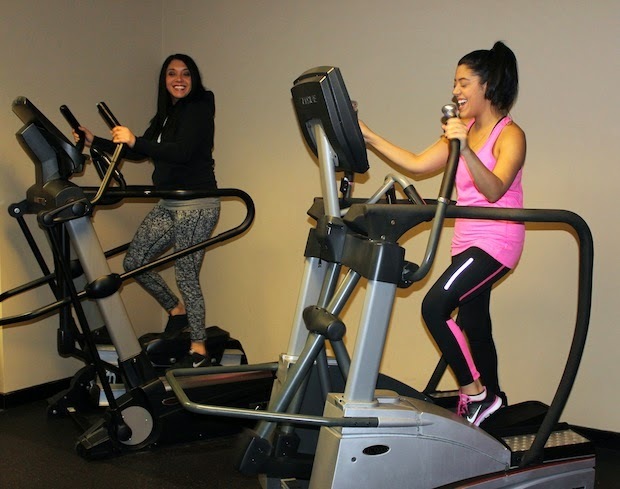 Cardio is my favorite! 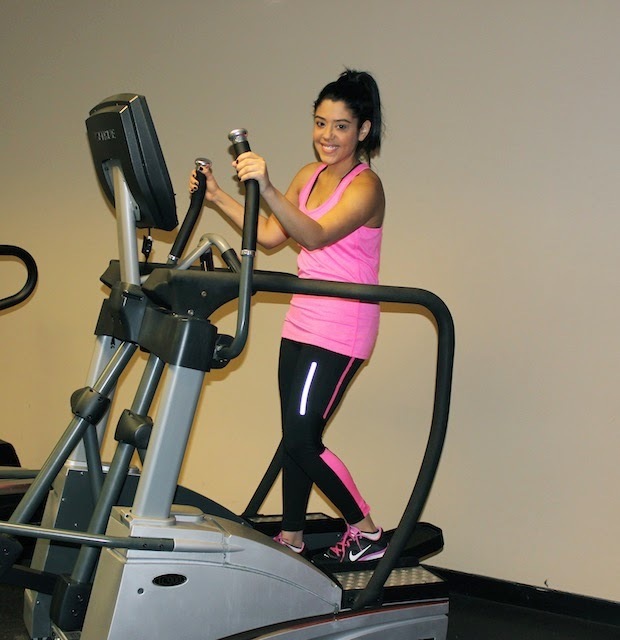 It’s too cold for me to run outside now, so sometimes I go to the gym just to use the elliptical or treadmill. When I go for weight training, I like to either start off with at least 15-20 minutes of cardio or I will end my workout with it. As much as I like to just put on my headphones, turn up the music and get in my zone, it’s also really nice having a workout buddy. Definitely makes the experience more fun and motivating. I also learn so much more too. We worked out at the gym in my sister’s condo. It’s small, but had everything that we needed. The lighting was not the best, so I apologize! 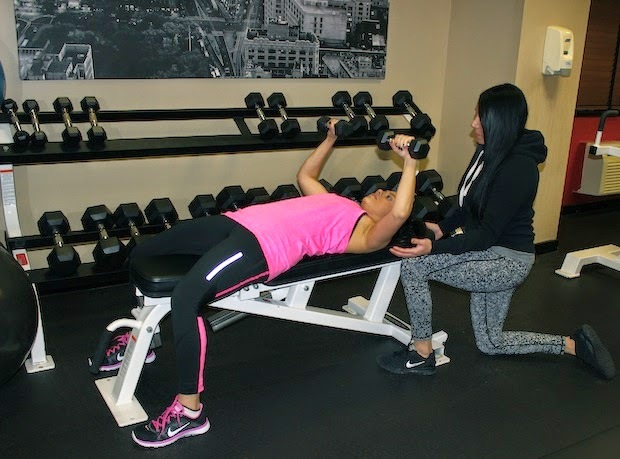 This is a flat bench chest press, which is an upper body strength training exercise. It helps to develop muscles primarily in your chest, arms and shoulders. In this photo, I was in the process of bringing my arms back down. I usually do only 5 or 8lbs. As I do this more often, I will increase the weight a little bit. This is a chest press machine. You’ll be using your chest, shoulders and triceps during this workout. You simply press out and return back. I start out with 3 sets of 10. I like this better than the flat bench press. 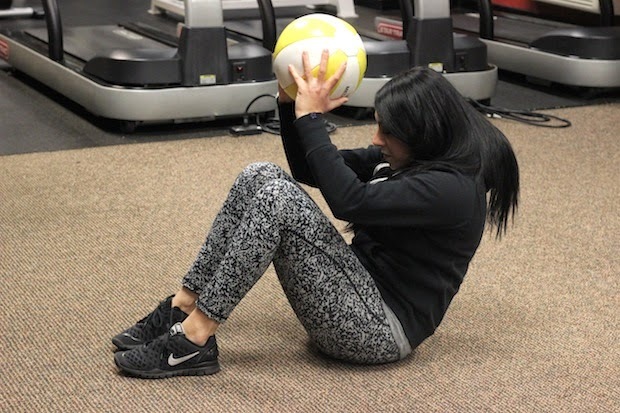 Using a medicine ball is a great way to do some exercises for your core. This is something that I need to get better at! First, Jessalyn did crunches with the ball and then push-ups. She did 4 sets of 15 for both. I can do regular crunches just fine, but doing them with a medicine ball makes it way more difficult. Guys, this was me after doing one. lol Yeah, I’ve got a lot of work to do. *This post has been sponsored by H&M. All opinions expressed are my own and this has not been edited by any third parties. Well done, pray i get motivated like you to start working out. I don't know how my comment got removed. But you look great I love both the pink and black. 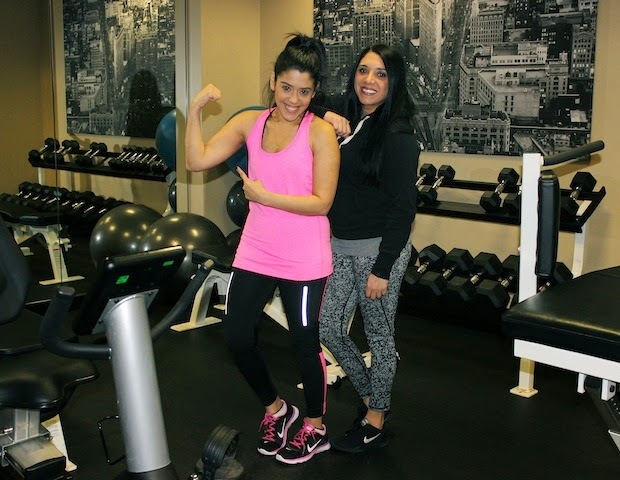 Please check out the Let's Get Fit 2015 fitness challenge we have on our blog. You look and did great. It would mean a lot of you joined my fitness group Let"s Get Fit 2015. More info can ve found on my blog.